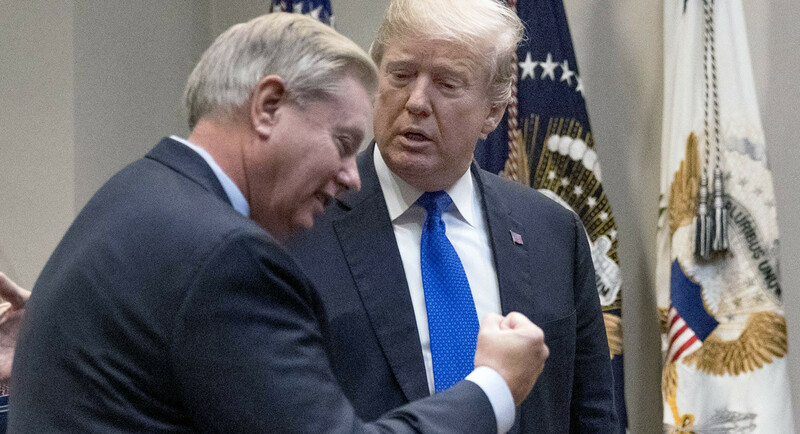 Lindsay Graham Donald Trump Lovers ? Lindsay Graham and Donald Trump were once adversaries. Politics is adversarial by its very nature gets deep dark and ugly. But some thing are so personal that they seems unforgivable. When Donald Trump implied Ted Cruz’s wife was unattractive and his father was involved in the Kennedy assassination, I’m not sure, how it possible to have a beer together after that. Lindsey Graham called Donald Trump a “race-baiting xenophobic bigot”. He called him the “World biggest Jackass” for trashing his good friend John McCain. He has call him unfit to be President (Questions?) He says his Character made him unfit. They disagreed about the Charlottesville rally .President Trump suggested there is moral equivalency between the white supremacist neo-Nazis and KKK members who attended the Charlottesville rally and people like Heather Heyer who was killed .I, along with many others, do not endorse this moral equivalency. Is it in his Kiss? In 2018, Lindsey Graham changed. In 2015, Trump was a racist, in 2018 Lindey said he had NEVER heard Donald Trump make a single racist statement. After calling him a kook, he says he “intends to support him in 2020 without equivocation. Graham said it was policy is what changed his mind. “He’s on track to do big things,” Graham says of the president. “He built up the military. I campaigned on it. He got out of the Iran deal. I campaigned on it. He’s destroying ISIL. I campaigned on it. He’s restructuring the tax code and the way we do business. I campaigned on it. He’s doing much of what I campaigned on, and I’m pleased.” Graham now speaks regularly with Trump and has become a close ally on matters ranging from North Korea to health care. Graham, supports the Presidents North Korean Policy he believes Trump agrees with him that a war with North Korea is better than letting North Korea develop an arsenal of nuclear-tipped missiles that could strike the United States. This entry was posted in National Politics, Politics, Twitter, Uncategorized and tagged Lindsay Graham, President Trump, Relationship. Bookmark the permalink.